Pakistan confirmed Saturday that two of its soldiers have been killed in ongoing military skirmishes with India across the disputed Kashmir border, known as the Line of Control (LoC). This comes a day after Pakistan, in a “gesture of peace,” returned an Indian pilot who was captured alive when his plane was shot down. The overture does not seem to have affected the situation in Kashmir, which continues to be the scene of relentless heavy mortar and artillery shelling between Pakistani and Indian militaries. The army’s media wing said the fatalities occurred in the Nakiyal sector on the LoC, which separates the Pakistani and Indian portions of the divided Himalayan region. Sources in the area say the soldiers were killed in the early hours of Saturday morning. Also Saturday, India repatriated the body of a Pakistani prisoner who was killed by angry inmates in an Indian jail following a February 14 suicide bombing in Pulwama. A Pakistan foreign ministry statement issued after receiving the body of Shakir Ullah said he was killed in the Indian jail in Jaipur. It reiterated Islamabad’s demand that New Delhi urgently share findings of the inquiry and post-mortem report and that the culprits be taken to task. Within the past two days at least six Pakistani civilians have died in shelling from India, the statement noted. It went on to claim there were reports of troop casualties and damage to outposts on the Indian side “due to an effective response by the Pakistan Army.” It was not possible to independently verify the assertions, nor was there any reaction from Indian military officials. Indian authorities said heavy mortar and artillery shelling from Pakistani forces Friday night killed a woman and two children, raising the overall civilian death toll to four. They also confirmed two Indian soldiers were injured. Indian media reported that all education institutions within a five-kilometer radius of the LoC remain closed Saturday for a fifth consecutive day. Indian paramilitary soldiers order commuters to turn back during a security lockdown in downtown Srinagar, Indian-controlled Kashmir, March 1, 2019. Tensions between nuclear-armed neighbors India and Pakistan have escalated since Tuesday when Indian aircraft launched a cross-border airstrike at what New Delhi alleges are terrorist camps run by a militant outfit blamed for the suicide car bombing in Kashmir. On Wednesday, Pakistani forces retaliated and said they shot down two Indian jet planes for violating the Kashmir LoC, pushing the two countries to the brink of another war. The tensions were only escalated after Pakistan captured the Indian pilot. The Pakistani government condemned the Indian cross-border airstrike as a violation of international laws. It strongly rejected as baseless the claims the so-called strikes hit “terrorist camps” and caused casualties or material damage. But the threat level remains dangerous, with Pakistani ground and air forces on high alert, said Pakistani Foreign Minister Shah Mehmood Qureshi on Saturday. Authorities have partially opened Pakistani airspace for commercial flights after several days of closure. The February 14 blast in India's Kashmir’s Pulwama district targeted a military convoy and killed 40 security personnel in the deadliest-ever attack in the region. Islamabad denied involvement and demanded India share “actionable evidence” to allow authorities to bring to justice any Pakistani who was linked to the violence. 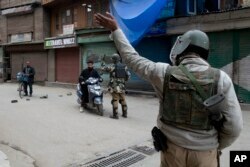 Pakistan confirmed on Thursday it received a dossier from India containing “evidence” about the Pulwama bombing. Officials said they are examining the dossier and promised to take action if it contained enough evidence. Islamabad maintains that the Jaish-e-Mohammad (JeM), the militant group New Delhi has blamed for plotting the Kashmir attack, is a proscribed organization in Pakistan. The founding leader of the group, Maulana Masood Azhar, lives freely in Pakistan and authorities say they would need solid evidence acceptable to Pakistani courts to prosecute Azhar if he has played any role in the violence. Pakistan and India have fought three wars, two over Kashmir. They have both armed their militaries with nuclear weapons since their last war 50 years ago, raising fears another conflict could escalate into a nuclear exchange.